"What Kryptonite Does Not Kill... It Only Makes Stronger... "
A heavily guarded Lex Luthor, while his body resting in the sun on the prison grounds, is meeting with his associates in his solar powered brain implant the Hub. 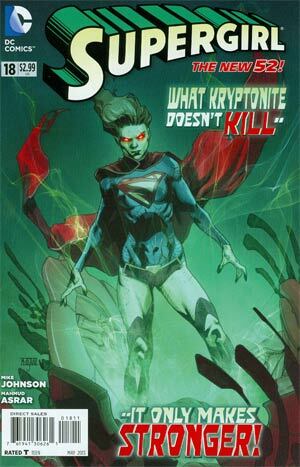 They are monitoring Supergirl as she is being treated for Kryptonite poisoning from her battle with H'el. Kara is being bathed in solar energy outside the Proxima One space station. Doctor Veritas is treating her and advising her to wait until she is certain that the radiation is no longer in the Lost Daughter of Krypton. However, Supergirl is impatient and sullen. She leaves Proxima One believing she's fine while smashing super drones. Little does our heroine realize that she may be in more lethal danger very soon. Karen Starr, the owner of Starr Enterprises who is really Power Girl, is watching news of the recent conflict with H'el and the resulting task force that the United States government is creating to deal with superhumans. She feels a connection to Supergirl somehow in addition to sensations of being ill. Kara Zor-L will, however, have to learn more of this mystery later, for she must attend a board meeting shortly. Supergirl will have to wait a little while longer. After losing their trace on Supergirl, Lex Luthor and Alphina have found her below the Earth's surface in battle with the lava girl last seen in Superboy #3. She has a hatred of all Kryptonians because of what they did to her planet. This brings Supergirl's angst and grief further to the surface. In spite of being more powerful than before, Kara feels dead inside. She gives up. The two combatants fall to Earth, where helicopters await to take the Maid of Might. Meanwhile Karen Starr has collapsed from a nosebleed in the middle of her board meeting. Could this lead to Kara Zor-El meeting Kara Zor-L? The next issue may have the answer to that question. Story - 3: This was a difficult issue to rate as is the case for most guest writers' stories in comics for me. It is a good story, but there are moments where it feels like Frank Hannah's style doesn't fit into what's been done by Mike Johnson since the re-introduction of Silver Banshee. This is particularly true toward the end and the panels with Power Girl. Her being in this issue feels a bit tacked on at the last minute. Still, I am curious about the direction her appearance will lead to in forthcoming issues. In the end, Hannah tries to capture the same atmosphere as Johnson. Yet, this fill-in does tend to stick out like a sore thumb at some points throughout the book. Art - 5: I admit I miss Mahmud Asrar's interior art. Yet, Robson Rocha seems to combine styles of Gary Frank and Michael Turner. I'm not familiar with his work, but I like what I've seen in this issue. I hope to see more of Rocha's stunning art in more comics in the future. Cover Art - 5: In a word, AWESOME. Mahmud Asrar really created an amazing image that really made me impatient to open the comic book and read it.